The best way to minister for the Earth is to help kids feel connected to the Earth. We have found the same thing to be true for adults. When you connect to the Earth, you connect with your ancestors. You connect with others and with the deepest part of yourself. You connect with all of life. That’s why we regularly celebrate the Pagan wheel of the year in our Sunday school program at Jubilee! Community Church in Asheville, North Carolina. The modern-day Wheel of the Year includes eight festivals that correspond with the seasons. Four of them are associated with the solstices and equinoxes. In the northern hemisphere, we have: the vernal equinox (around March 21), the summer solstice (around June 21), the autumnal equinox (around September 21), and the winter solstice (around December 21). Most Americans consider these solar events as the start of a new season. The other four festivals on the Pagan wheel are called cross-quarter holidays. They occur roughly 40 days into each season. Beltane falls around May 1. Lughnasadh (or Lammas) falls around August. 2. Samhain (pronounced SAH-win) falls around November 1. Imbolc (or Brigid) falls around February 2. The modern-day wheel of the year is the result of combining two historic calendars: the Mediterranean planting calendar of solstices and equinoxes, and the Celtic calendar of cross-quarter days. These were combined in 1957 in the Gardnerian tradition of Wicca to become “the Wheel of the Year,” and spread from there to become common in the modern Pagan community. These holidays honor the Earth and the changes that take place over the course of the year. There’s no need for teachers to rely solely on published books for crafts and activities. Take advantage of your local area. Share your excitement about world around you. Lead a hike to a local waterfall or hidden stream. Encourage kids to notice how the Earth smells and sounds. Ask the kids to get close to the ground so they can see what things are growing and crawling there. Allow them to put bare feet in cold water. Similarly, any crafts that make use of nature can be part of your celebration. Leaf rubbings, corn husk dolls, baking bread, and making flower garlands all give kids opportunities to touch nature and to create with nature. In addition to crafts, invent games with shells or rocks. The games don’t have to be elaborate. For example, ask the kids to work together to set up a large rock that can serve as a target. Then have everyone collect five of their own rocks and mark them in some way. Toss the rocks at the target and see who hits it the most. Or, let all the kids study their own small group of rocks for one minute. Then, collect them all in a large pile and ask them to retrieve their own rocks based on their recollections of the shapes, sizes, and colors. These images above and to the right were taken at a recent Imbolc ceremony that I attended. We met at an old springhouse found along a public hiking trail. The Pagan community in Asheville has dedicated this spot to the ancient Celtic goddess, Brigid. The kids removed leaves, rocks, and other debris preventing the spring from running through the structure. Then, we offered flowers, milk, and other items associated with the holiday. 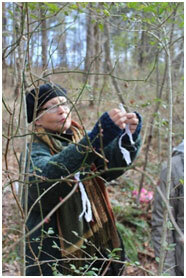 We also tied clouties – small pieces of cloth or yarn – onto nearby trees as prayers for healing both ourselves and the Earth. The most important piece of celebrating the Earth is the “celebration” part, so start by simply sharing your joy and enthusiasm with the kids in your life. Several children’s books are available. Some of them share the stories and legends surrounding the gods and goddesses honored during these festivals. Some present the different ways in which people celebrated throughout history. Many of them include ideas for modern-day celebrations through crafts, activities, cooking, or rituals. An excellent series of books is available by Ellen Jackson on solstices and equinoxes. Marketed to kids age 6 and up, these books offer great kid-friendly overviews of how various cultures have marked these events. Her most popular book is Winter Solstice, which provides easy-to-digest information about how this holiday has been observed around the world and throughout history. Lots of ideas for simple crafts and activities can also be gleaned from the material presented. Jackson’s books on the summer solstice, the autumn equinox, and the spring equinox are also available, although they are becoming increasingly hard to find. Of those three, we most frequently discuss the spring equinox with our kids at Jubilee! Community Church because many traditions associated with Christian Easter – like bunnies and egg decorating – originated with ancient celebrations of new life springing forth at this time of the year. Analogous cultural adaptations are also seen in some of the cross-quarter holidays. It is no accident that All Souls’ Day, All Saints’ Day, and Halloween all fall at the same time as the pagan festival of Samhain. In ancient times, it was said that the veil between the living and the dead was at its thinnest during this time, which allowed for better communication with those in the other world. And ancient Brigid, at some point in time, was morphed into St. Brigid for Catholics. Her feast day, you guessed it – February. 1. She offers a wonderful way to teach interfaith to kids. Other books focus on the cross-quarter holidays or on the entire wheel of the year. 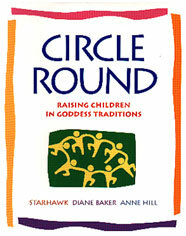 The quintessential guidebook for adults who work with kids is still Circle Round: Raising Children in Goddess Traditions written by Starhawk, Diane Baker, and Anne Hill in 2000. The stories presented are too long for our Sunday school purposes, but we frequently use their craft ideas, cooking recipes, and suggestions for making altars. More recently, Siusaidh Ceanadach, a celebrant and co-organizer of a Druid group in Glasgow, has written two Let’s Talk About books geared to kids. One is about pagan festivals and the other is about the elements and the pagan wheel. Both include stories and activity ideas. For slightly older children (age 9-12), there is Ancient Celtic Festivals and How we Celebrate them Today by Claire Walker Leslie and Frank E. Gerace. There is also a nice book on Lammas that we use – Lilith Celebrates Lammas by Lorin Manderly and Dan Drewes. Other books that focus specifically on individual cross-quarter holidays are still fairly hard to find. The Pagan solar-based holidays are more than a quaint set of traditions. They are festivals still celebrated by people all over the world who want to honor the Earth. There is no ancient sacred text, and like many other indigenous traditions, there is a lack of standardization. Instead of being nervous about that, try to relish the freedom it allows. It doesn’t take much to help kids notice the splendor and beauty of the natural world. And as the facilitator, you might find that you notice a few more things, too. Some may wonder why a Christian congregation would focus so much attention on Pagan resources, so let me share our educational perspective. We’ve developed a Bible-based, interfaith curriculum that we use with kids from preschool through 8th grade. They learn the basic Bible stories and then use these themes and narratives to connect with other faith traditions. For example, when they learn about Jesus praying in the Garden of Gethsemane, they also learn about prayer mats, prayer flags, prayer wheels, and prayer beads. We want the kids in our program to be grounded in our Judeo-Christian culture, but we also want to provide them with the tools they need to follow their own faith path. In addition, we actively foster relationship with the Earth. We want youngsters to find the sacred in nature, to understand their connection to the environment, and to celebrate all of creation. These values are found throughout the world’s faith traditions, and many religious holidays coincide with seasonal changes. Kids understand seasons. They feel the changes in temperature, see the changes in plants, and associate certain events with certain seasons. Pagan wheel-of-the-year festivals offer us another opportunity to highlight the shared principles that all faith practices glean from the Earth’s wisdom. Older PostRev. Jennifer Bailey – What Defines a Millennial Interfaith Leader?